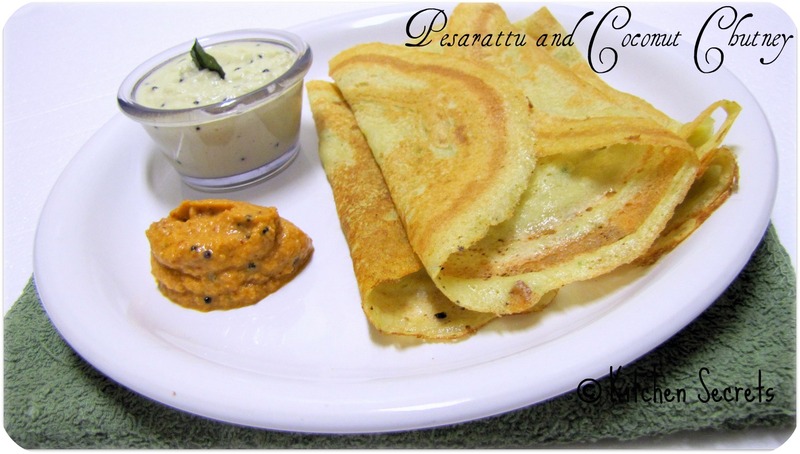 Pesarattu is a breakfast food of the andhra region . It is mainly preapared using moong dhal and the rice is added to ensure crispiness . Traditionally , it is served with onion topping ( no toppings for me, since VJ has a stable cold..)and ther's this chutney " Ginger chutney " specially meant for pesarattu is served alongside. Here I had made both ginger and coconut chutney and it was out of the world with pesarattu... Hmm.. Tasty breakfast to start a day and with ginger ,makes our body whole day fresh and healthy..
Soak the moong dhal and rice seperately for 3 to 4 hours and grind it with ginger, green chiillies and cumin seeds . ( If u don like grinding the cumin seeds , u may mix the cumin seeds with the batter.) Grind to a smooth texture and the batter consistency should be like Adai batter. Mix the salt and combine well. Rest this for 10 minutes. ( resting is purely optional ) . Heat a tava /dosa pan and apply few drops of oil. Pour a laddle of batter in the center and spread it around like u do for dosa. Keep the flame in medium. Drizzle some oil on the sides and wait for few minutes until the bottom which is exposed to heat turns golden. Now flip the pesarattu and cook for few seconds. Again flip it back and spread the chopped onions on the top of pesarattu. Now fold it from the ends and serve with Ginger chutney .. But my VJ hates ginger chutney, hence made this coconut chutney ..
First grind the green chillies,ginger ,tamarind , salt and the onion to a coarse paste adding litttle water. Finally add the shredded coconut and grind to a fine paste ..( u may also grind to a semi coarse paste , it's totally ur family choice ) . Heat a pan with a tsp of oil and do the tempering with the mustard seeds. Once it finished popping , add the urad dal and fry until golden. finally add the curry leaves and transfer the seasoning to the chutney and combine well. U may also add little bit of water if u like a thin chutney, but I always like thick chutney ( katti chutney ..Yum).. Goes good with all tiffin varieties..
Crispy pesarattu love it..my friend serves this with upma..
Pesarattu and chutney looks awesome combo. I love pesarattu.. If you have not tried.. try that combined with Upma... thats the most famous combination ever..
lovely and mouthwatering peserette with a lovely chutney. Wow, urs is paper thin, very crispy and appetizing. Love pesarattu,delicious spread,makes me hungry. Love this dish a lot, Im drooling over this one. pesarattu with ginger chutney is my fav..very tempting dish!! I love it Shanavi, great recipe for that chutney girl!! Wow such a inviting platter..loooks so delicious..
sorry dear ,bit busy with my marathon.lovely and crisp dosai. Looks so inviting and healthy!!! 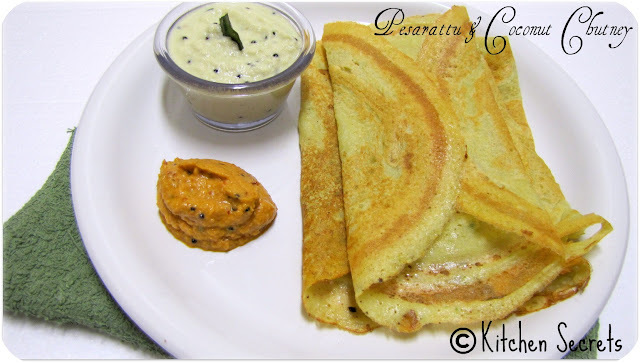 Do chk out my blog when time permits..
Pesarattu Green Gram Dosa looking yum and crispy.